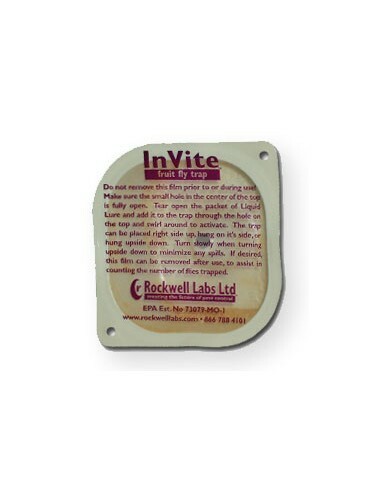 Rockwell Labs InVite Fruit Fly Trap captures fruit flies and leaves the area fruit fly free ! Quick and easy to use, the InVite Fruit Fly Trap can be placed on a counter, hung on a wall, or hung upside down, such as under a bar. The potent fruit fly lure system works for both red eyed and dark eyed fruit flies. Traps and killing stations are useful for knocking down adults, continual adult harvest, capturing invaders before they establish and breed, and monitoring. Quick and easy to use, the Rockwell Labs InVite Fruit Fly trap can be placed on a counter, hung on a wall, or hung upside down, such as under a bar. Place 3 or more Rockwell Labs InVite Fruit Fly Traps in areas where adult flies are seen for best results. Place 3 or more InVite Fruit Fly Traps in areas where adult flies are seen for best results. Fruit Flies are about 1/8th inch long with tan to dark brown or black bodies and large red or dark eyes. Yeast driven decay (fermentation) of carbohydrates can occur anywhere food and moisture collect and are undisturbed, such as any crack or crevice in a food preparation area or in drains. Fruit Flies are attracted to fermentation because they and their larvae feed on yeast, so a typical bar or restaurant account is full of potential breeding sites. Fruit flies are not attracted to light except for a short period of time after they emerge as adults.